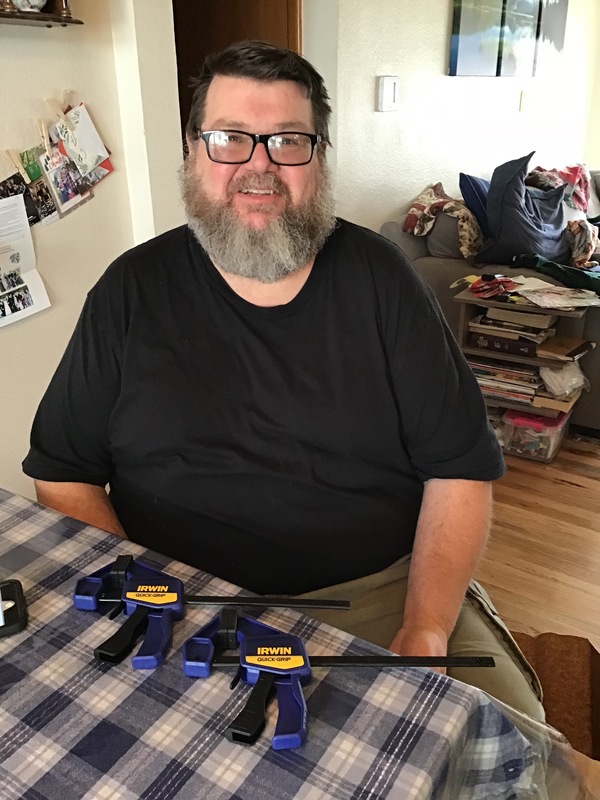 Rob was able to get these clamps very inexpensively using a coupon from Ace Hardware combined with a sale. He was mailed the coupon because he has a birthday in the month of January. I think in the end, the price tag was about $5 for both. Patsy took this picture on New Year’s Day. 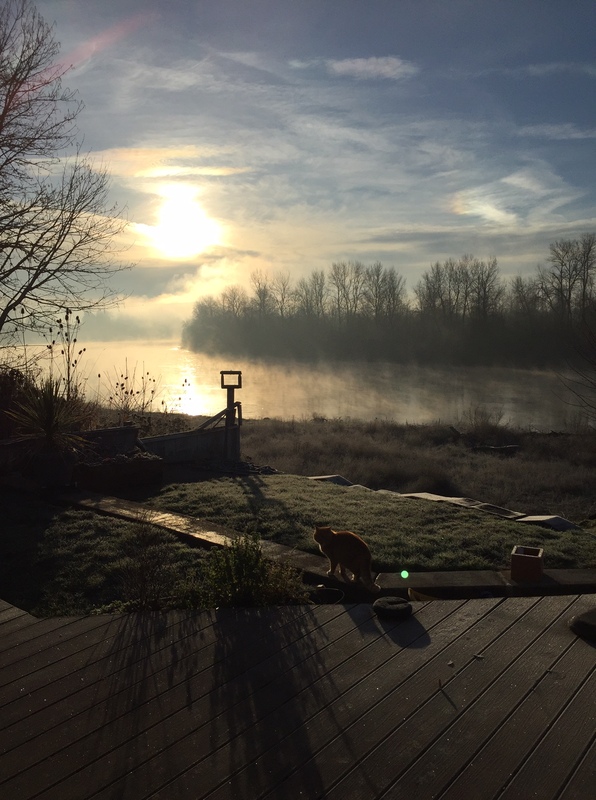 Its a view of the Willamette River, from my sister’s deck. She especially loved that she got the cat in there. I love how it shows how very frosty and cold that morning was! We get a lot of enjoyment from the river. 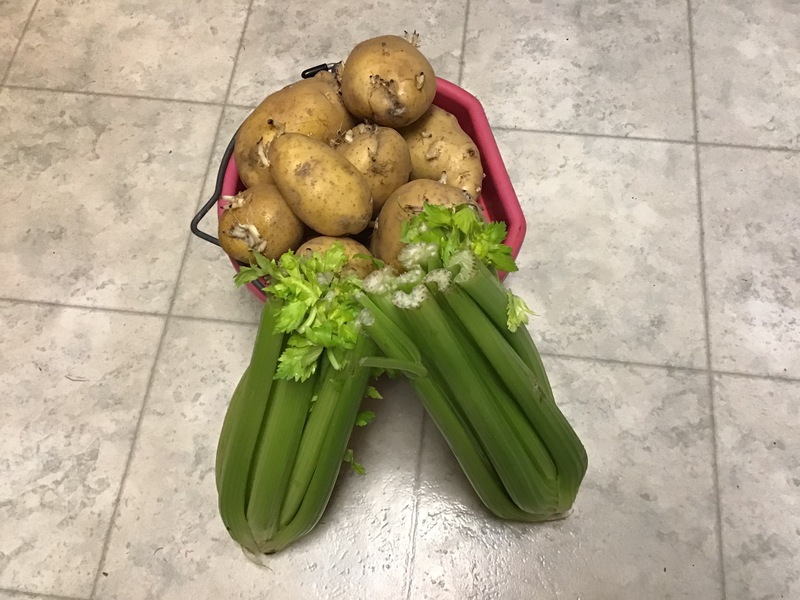 Today, at church, my aunt noticed a bin of potatoes and celery that were for people to take. She got me one of each, since she didn’t need them and I looked after second service and there were some left, so I grabbed another one of each. The potatoes need to be used quickly. How handy! I just finished turning the ones I had at home that were sprouting just like these into potato salad! We had a family birthday party scheduled for today. Unfortunately, we had to cancel as the birthday boy (Jake) was sick. (The birthday young lady (Alissa) and the birthday man (Rob) were not, but they will have to patiently wait for the reschedule date!). 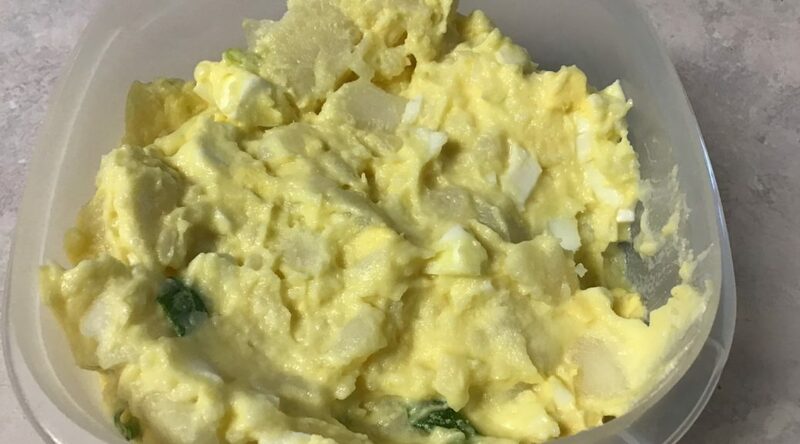 Thankfully, we were able to parcel out the enormous bowl of potato salad amongst the relatives anyway! Rob and Alissa have not missed one year of celebrating together in all of her 18 years. Of course, Jake joined in when he was a baby, sitting on a table at Chuck-E-Cheese in his carrier. What a birthday surprise that was for Rob and all of us! So many memories of birthday parties in many places with many themes……. One of the best was when my sister put on a “Beauty and the Beast” birthday party with all girly things and a princess at one end of the cake for Alissa and the Beast on the other end, for Rob. 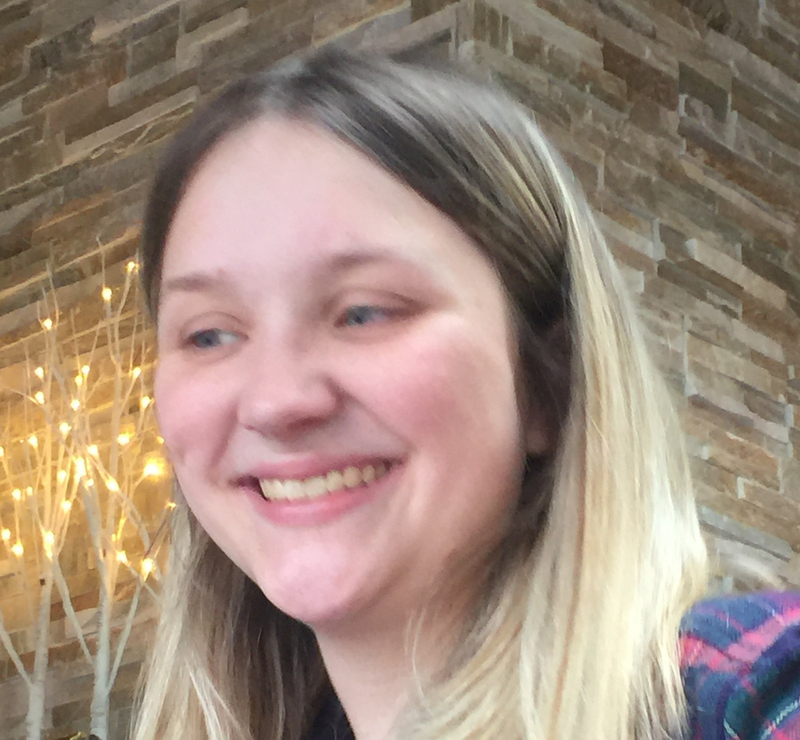 I can’t believe she’s 18! But, she is. It’s been amazing to see that little, cute, curly-headed blond baby become a strong, confident young lady in what felt like a blink of an eye. One of my Christmas gifts was a little planter with some seeds to grow basil on the windowsill. There were extra seeds so I used the container that my Christmas poinsettia was in, filled with new potting soil. 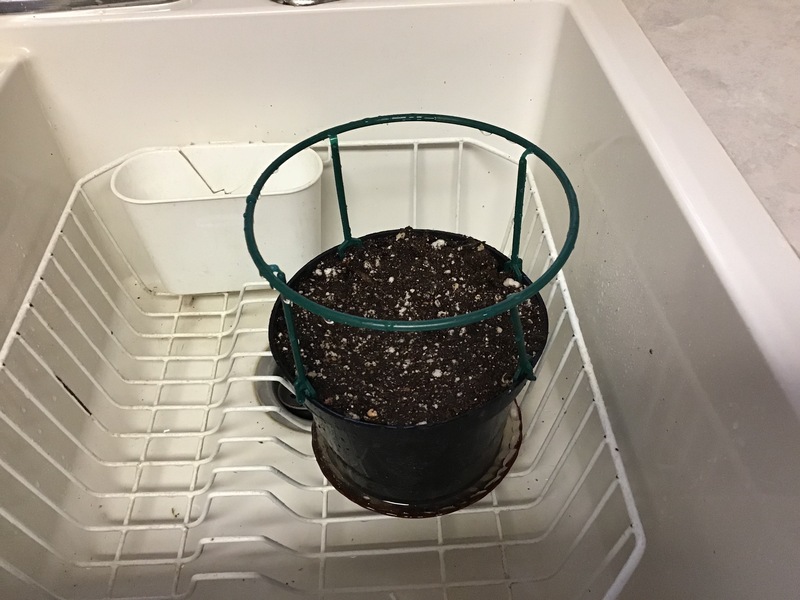 Since the flower died because I think it got too hot near the wood stove where it was, I was glad to repurpose the pot and use all the seeds up, and hopefully, I will have basil in 2 pots. I’ve been sorting through my seeds and hope to get my order finished up soon. I have quite a few 1/2 packets left from last year. Happy Birthday to your beloved! I love Patsy’s pic of the river. I did pull two things out of the freezer since your last post. Some pesto from last summer, and while there, I found rolls from 2016, which the chickens got. Every little bit helps. We need to go through our seeds to see what’s needed, before perusing the catalogs, which can be dangerous :o). I’m sure the chickens are happy. That always happens to me, too—just when I think I’ve got things organized, I find something lurking in there and it’s got to go! Happy Birthday to all of them. I hope Jake is feeling better soon and doesn’t share his germs. I wish my church gave out free produce. Glad you got some free food. I know you will put it to good use. It’s not usual for the church to have free food after services. 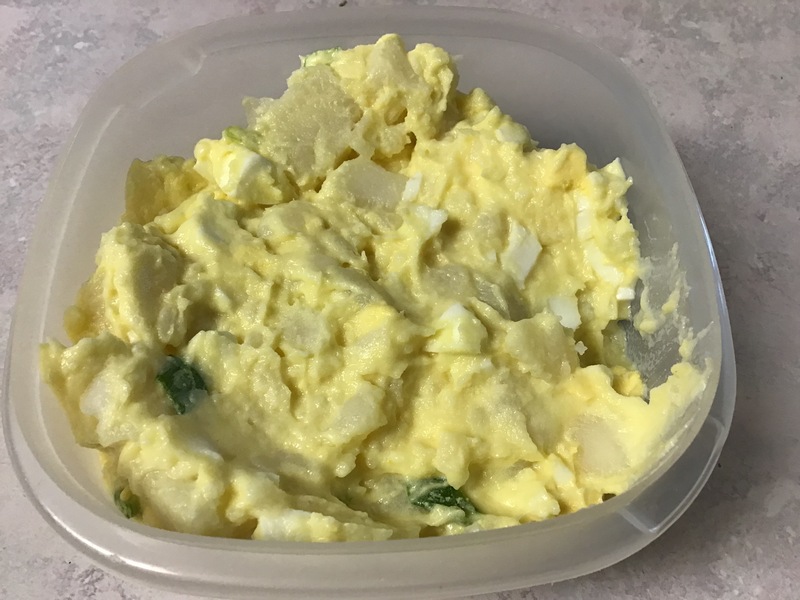 However, I know they do have a large food distribution ministry on Thursdays and I have a feeling that those potatoes and celery were left over from that so they just put them out. They certainly need to be used soon, especially the potatoes, so I’m guessing they won’t last until the next time. I like your new format–congratulations on putting in the effort to make it happen! Happy Birthday to Alissa and Rob! Alissa is a beautiful young lady. And, boy, Rob really looks like he has lost the weight. Congratulations to him for being so diligent on the weight loss, especially during the holiday season. The photo that Patsy took is really really nice. Has she ever thought about taking up photography as a hobby? From your previous posts, you had a busy but fun holiday. Hopefully you had (or will have) some time to catch your breathe. You are one very busy lady! I think Patsy does have a knack for photography, as well. I give her my phone to take pictures every so often. I should get her a digital camera one of these days. I like the new format. It looks great!